There is a significant confusion when I describe what I do to a Hebrew speaker. I use the word ‘rav’ rabbi and they tell me that isn’t possible because I’m a woman (as if I didn’t know). (Rav u’morah is what it says on my smicha). Sometimes a Hebrew speaker uses the word ‘rabanit’ which is a term of honor for a rabbi’s wife, the rebbetzin. Nope, not one of those either. There is no word in the Hebrew language for a female rabbi. Some of my colleagues like to use the term, ‘rabbah.’ I’m not one of them. Interestingly though, Rabbi Avi Weiss recently ordained the first female rabbi. There is a fascinating article from New York magazine that is worth the read both for its profile of Rabbi Weiss who is an important figure in our day, and of the notion of the ordination of women in the modern Orthodox movement. I’d love to know your thoughts on this. Feel free to comment. 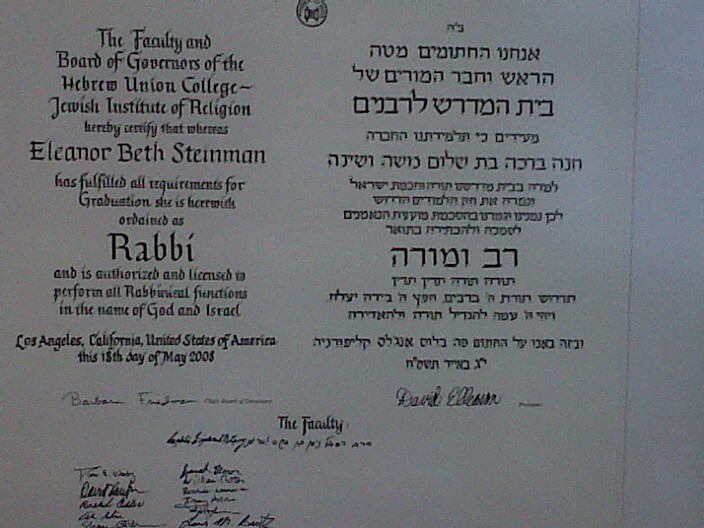 Oh and in case it wasn’t clear, you can still call me rabbi. Nice post RABBI!!!! It is difficult in Israel to tell people what we do, but I hope and pray that this will not always be the case! I’m happy to call you Rabbi. You can call me Ellie anytime. And you can also call to invite me to dinner anytime, too. Love to you and Rita.